Ever wanted to play a game where you are dashing round a strange land desperately trying to survive even though death is inevitable? Want to spend ages collecting resources to make basic tools and weapons knowing that no matter what you do you are going to die? Well look no further because Klei Entertainment has just the game for you! 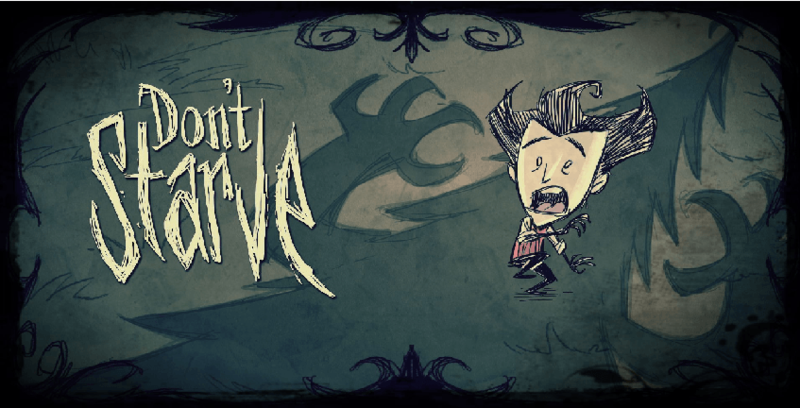 Indie game Don’t Starve, also out on PC, is a new(ish) release for the PlayStation 4 which sees you take the role of Gentleman Scientist Wilson. A small cut scene at the start of the game shows Wilson with his latest creation which goes horrible wrong, resulting in poor Wilson being trapped by a demon in a strange and mysterious wilderness. Afraid, defenseless and alone, our hero must now find a way to survive and defend himself before nightfall! The moment you start the game you are reminded of the swiftly approaching night, indicated by the timer at the top right corner of the screen, and so you must get to work straight away collecting resources like flint, logs, carrots etc. so you can make tools and weapons. It’s fairly easy to collect items, all you need to do is approach something and press X to pick it up where it will be stored in your inventory. When you have collected enough items you can start crafting them into things like an axe for chopping trees down (just in case you didn’t know what an axe was for) and a campfire which is vital for your survival when the sun sets. Sound familiar? If you think about what would be the result of Tim Burton and Minecraft having a love child then you’ve got a pretty good idea of what Don’t Starve is like. Don’t Starve is very pretty, with a Tim Burton style feel to it, and a Minecraft style inventory. Despite these similarities, at no point is there a sense of imitation. Instead, Don’t Starve takes these attributes and turns them into something unique. The layout and controls are fairly straight forward; the analogue sticks control movement and item selection, the PlayStation 4 controller’s touch pad brings up the map and the directional buttons dictate how you use a selected item. Pressing R2 brings up your inventory which is located at the bottom of the screen, and pressing L2 opens the crafting section on the left of the screen. Crafting things is very easy to do, just collect all items and required quantities, and then Wilson does all the work! On my first attempt at playing Don’t Starve I managed to last 6 days before getting ripped to pieces by a rabid dog. I was rather disappointed as I had just made myself an adorable little hat and I was just starting to grow a rather magnificent beard. Sadly when you get killed you have to start all over again with an empty inventory, which can get a bit depressing, but it just makes you more determined to survive!